Fantasy has become real! Join us for a real life Zombie Attack! Yes, you will be chased not on a computer, but in real life. You will play with other survivors and try to make it to the party headquarters alive! 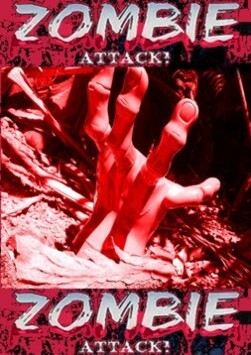 Zombies will hunt you down for your brains and if they infect you, you too will become a zombie seeking new victims! Where: Klitsgras Drumming Circle, Plot 62, Next to Exel Garage, 14 km after Hans Strijdom Rd, out on Garsfontein Road, Tierpoort, Pretoria East. Join us as a survivor or zombie for two to three hours of running,hiding, finding clues and screaming your lungs out. If you enter as Zombie please come fully dressed - we can also do your make-up. Survivors dress comfortably as you will get dirty when infected. Bring a flashlight - loads of fear and hunger! Once the social game is over (if you can call being hunted social) you will gain free entrance into the magnificent ANTIDODE Party where you will receive recognition for your achievement to stay alive or infecting as many as possible. The party will be epic and include numerous trance and hardstyle DJS including Psy Qi, Acid, and Chemical Noize... numerous dance competitions, a dance floor, quizzes, a horror lounge, foods and drinks for sale, fire performers and a lot more! The Zombie Attack players must arrive at 16h30 at latest for registration as the game starts at 17h00 strictly to end at 19h30 followed by the award ceremony and then party with other zombies. Open to ages 14 and up. Tickets available online -pay with your bank card or cash/deposits by contacting the event organisers via email/sms. Please note that if you only buy your ticket at the game, you must still confirm that you will play before 19 May 2012 and say whether you enter as zombie or survivor. Limited zombie spaces available. If you only want to go to the trance and hardstyle event Antidode Zombie Party arrive at 20h00. Must dress Zombie for party. We will transform the survivors of the game into zombies before entering the party. Bring extra money as loads of things to do and buy. Join in and write your own page! It's easy to do. How? Simply click here to return to Pretoria Events May.